Menkauhor Kaiu The divine places of Menkauhor Headless Pyramid ৫ম Saqqara c.52sq.x?h. n.d. n.d.
Merenre The beauty of Merenre appears Pyramid of Merenre ৬ষ্ঠ South Saqqara 78.75sq.x52.5h. c. 107,835 57°7'48"
Khui unknown Pyramid of Khui First Intermediate Period Dara 146w.x136d.x?h. n.d. n.d.
Merikare Flourishing are the abodes of Merikare Pyramid of Merikare ১০ম Unknown, possibly North Saqqara n.d. n.d. n.d.
(c. ১– 1803 BC) Lisht 84sq.x55h. 129,360 ৫৪° ২৭' ৪৪"
Amenemhat II Amenemhat is provided White Pyramid ১২তম Dashur 50sq.x?h. Amenemhat III Amenemhat is beautiful Pyramid of Amenemhat III ১২তম Dashur 105sq.x75h. 274,625 ৫৬° ১৮' ৩৫"
Amenemhat IV (?) অজানা Southern Mazghuna pyramid 12th or 13th South Mazghuna 52.5sq.x?h. (unfinished) n.d. n.d.
Sobekneferu (?) 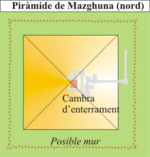 অজানা Northern Mazghuna pyramid 12th or 13th North Mazghuna > 52.5sq.x?h. (unfinished) n.d. n.d.
অজানা অজানা Southern South Saqqara pyramid 13th South Saqqara 78.75sq.x?h. (unfinished) n.d. n.d.
↑ The pyramid complex covers ৩৭ একর (১,৫০,০০০ মি২) and provides several cultic buildings. It is one of the best preserved Old Kingdom royal cemeteries and hides several, huge underground mazes of niched corridors and chambers. ↑ Rediscovered in 1951 by Zakaria Goneim. Famous for its sarcophagus made of alabaster, which was found in situ and sealed. Surprisingly, the sarcophagus was empty and possibly never in use. ↑ The connection to king Khaba is disputed, since not a single artifact with any royal name was found in the underground chambers. ↑ ক খ গ ঘ ঙ চ ছ Pyramid complex includes a satellite pyramid. ↑ ক খ Pyramid complex includes a satellite pyramid and 3 queens pyramids. ↑ For the problematic, see: Jürgen von Beckerath: Chronologie des pharaonischen Ägypten. Die Zeitbestimmung der ägyptischen Geschichte von der Vorzeit bis 332 v. Chr. (= Münchner ägyptologische Studien, vol. 46). von Zabern, Mainz 1997, আইএসবিএন ৩-৮০৫৩-২৩১০-৭, page 158. ↑ Rainer Stadelmann: Die Ägyptischen Pyramiden: vom Ziegelbau zum Weltwunder ( = Kulturgeschichte der antiken Welt, vol. 30). von Zabern, Mainz 185, আইএসবিএন ৩৮০৫৩০৮৫৫৮, p. 77, 140-145. ↑ Six ink inscriptions once contained a cartouche name, which remains illegible. There are dozens of different readings proposed by Egyptologists. See: Miroslav Verner: Archaeological Remarks on the 4th and 5th Dynasty Chronology. In: Archiv Orientální, vol. 69. Praha 2001, page 363–418. ↑ Pyramid complex includes 3 queens pyramids. ↑ Originally built a stepped pyramid. 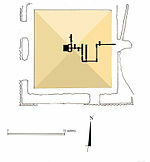 ↑ Pyramid complex includes a satellite pyramid and 1 or 2 queens pyramids. ↑ Pyramid complex includes a satellite pyramid and 1 queens pyramid. ↑ Pyramid complex includes a satellite pyramid and 2 queens pyramids. ↑ Pyramid complex includes a satellite pyramid and 5 queens pyramids. ↑ Last pyramid built in Saqqara. ↑ Unclear if it was a step pyramid or a giant mastaba. ↑ Archaeologically attested, but still unidentified. ↑ Pyramid complex includes a satellite pyramid and 9 queens pyramids. ↑ Pyramid complex includes a satellite pyramid or a queens pyramid. ↑ Pyramid complex includes 7 queens pyramids. 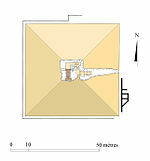 ↑ Pyramid complex includes a satellite pyramid and two enclosure walls. ↑ Built as a Cenotaph. It is the only royal pyramid in Abydos.